What is in a typical issue of M&B? On the Road—noted running scribes share observations and opinions about long-distance running. Columnists have included Kathrine Switzer, Roger Robinson, Scott Douglas, Joe LeMay, Barry Lewis, Ellen Curtain, Joe Henderson, and the department currently features Don Kardong. In addition to our regular departments and columns, you will find at least a dozen full-length feature stories in each issue. About once per year an issue will contain a special section—a cluster of articles on one particular topic. 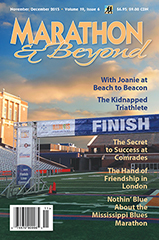 Past special sections have covered such topics as Death Valley, The Search for the Perfect Marathon, Western States 100, Masters Running, Sports Medicine, and the Antarctica Marathon.